Development of energy infrastructure plays a crucial role, as asserted in the ASEAN Plan of Action on Energy 2010-2015 (APAE), to ensure that ASEAN economic development is sustainable through, among others, mitigating greenhouse gas (GHG) emission. One of priorities of APAE is promoting good energy management practices through that narrowing the development gap (NDG) among member countries for faster ASEAN integration. It is estimated that the buildings sector accounts for approximately 40% of total energy consumption in Vietnam. Thus savings energy from the sector plays an important role in cutting GHG emission. Green buildings is an approach that focuses, among other, on energy efficiency of the buildings. Green building has become popular in the world as well in ASEAN. To assess whether a building is really green, a Green Building Rating System is needed to indicates how environmentally sound a building is. A range of green building rating systems, protocols, guidelines and standards have been developed in the past 20 years that respond to the need to evaluate and benchmark levels of building achievement in the green revolution. BREEAM (Building Research Establishment’s Environmental Assessment Method) of UK, LEED (Leadership in Energy and Environmental Design) of US, CASBEE (Comprehensive Assessment System for Building Environmental Efficiency) of Japan or GREEN STAR of Australia are the most popular and influential among many other rating systems. Within ASEAN,most of the member countries have already developed their own green building rating systems: Indonesia has GREENSHIP; Malaysia has GBI (Green Building Index); the Philippines has BERDE (Building for Ecological Responsive Design Excellence); and Singapore has GREENMARK; Thailand has TREES (Thai’s Rating of Energy and Environmental Sustainability); Vietnam has LOTUS (by Vietnam Green Building Council or VGBC) and a newly ratingtools developed VACEE (by Vietnam Association of Civil Engineering Environment). It is worthy to note that several of them were developed from LEED with modifications to reflect local interest. 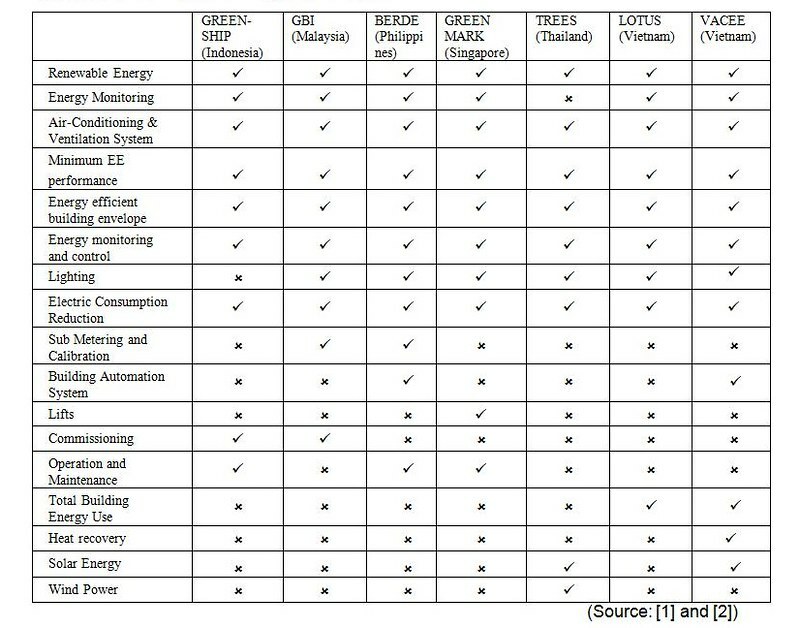 Below is the comparison of typical ASEAN greenbuildingratingsystems on credits to various aspects of using energy in an existing residential building. Air conditioning and ventilation system (HVAC)is also very important to provide comfort for the tenants, as it usually contributes the most energy used in a building. Good natural ventilation design and energy efficient air-conditioners are being considered. Minimum energy efficient performance is also being considered to reduce CO2 emission to the atmosphere with the reduction of energy consumption in industrial buildings. The use of energy is also being monitored and controlled to increase the building’s efficiency. The last common ground is energy consumption reduction. It aims to minimize the heat gain to reduce the overall cooling load. Besides aspects common interest, there are still several crediting criteria only available in certain systems, for example the building commissioning, or operations and maintenance. It reflects variance in the priority of each country on important features of green buildings. The newly established ASEAN Economic Community opens a much larger market for green building development, and also raises the need for a green building rating system that addresses the concerns of each country and is recognized by ASEAN Member States. Such an ASEAN green building rating system is necessary and inevitable in the near future, and it will encourage all state members to pursue a greener, healthy and more energy efficient lifestyle. 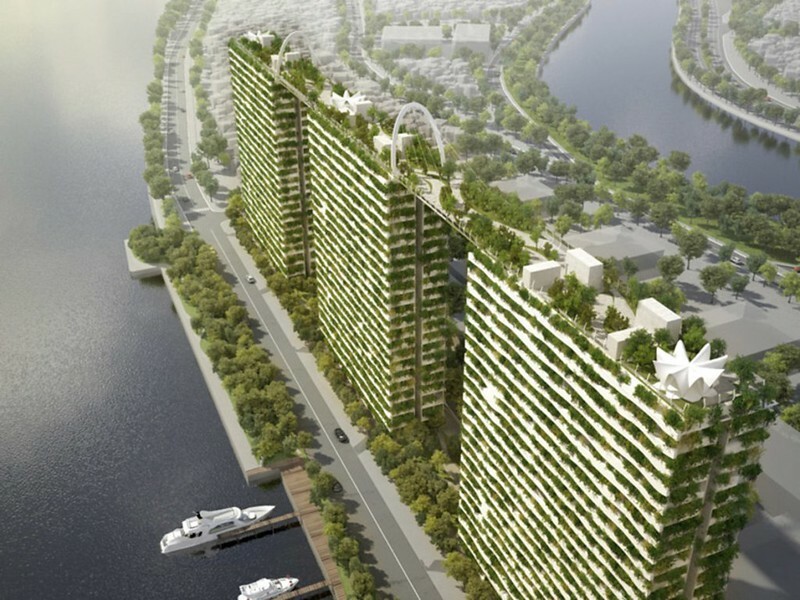 Toward this target, Vietnam is planning for a regulation on green building development in the form of a ministerial circular, expected to be issued in 2016. This regulation will provide legal basis and technical guildeline for green building throughout the country. The Fellowship from ASEAN-US Science and Technology Program has provided some technical assistance to Ministry of Construction in preparing that technical guildeline. The first step is to improve the current local green building rating systems, making use of advantages of other countries’ rating systems. Then a database of energy efficicency materials will be formulated to support the implementing of green buildings.